Product Manual Revisions: In an effort to provide our customers with the best product technical documentation possible, Universal has initiated a program to continuously review and update product manuals. Our manuals are printed in-house when each product order is filled to ensure that our customers receive the most up to date and comprehensive documentation available. The only objective of this program is to convey, in the most efficient manner possible, the information needed for the proper installation and operation of our products. We encourage our customers to contact us if you discover any errors and/or omissions in these manuals and we always welcome suggestions for improvements. If you are an existing customer and would like to receive a revised manual for your Universal product, they can be ordered from our Customer Service Department for a nominal fee or downloaded at no cost. New Manuals - Download In Adobe Acrobat Reader Format: As soon as new manuals are released, we convert them to Adobe Acrobat Reader format and post them on our Website. Download buttons are installed on the appropriate product pages and on this page. The download versions of these manuals are identical to the manuals supplied in hard copy and include all photos, drawings and parts diagrams. To see if you have the latest version available, check the Revision Number which is located at the bottom of the front cover of each manual and compare it to the Revision Numbers listed below. For best results, save the files to disk and print in high resolution or best quality mode on your local printer. Universal USMR-20AF Micro-Spray Markers: This manual covers both spot marking and line marking applications. Detailed instructions are included for both pneumatic and electrical connection and triggering options for controlling the marker with a PLC or a modular One-Shot Timer. A new Troubleshooting section includes photos of spot patterns and diagnostics. Step by step instructions with photos cover the disassembly of the marker and seal replacement procedures. Universal HP-100 & HP-200 Series Hand Printers: This manual covers both indexing and non-indexing models and features a new Quick Start section. The significantly improved Maintenance section includes detailed instructions for replacing and adjusting the Index Spring on the HP-200 Model. The step-by-step instructions are accompanied by over 50 photographs of the maintenance procedures. If you have one of these printers - you'll want this new manual. Universal HPL-100 thru HPL-400 Series Large Capacity Hand Printers: This manual covers both indexing and non-indexing models. The Quick Start section includes instructions for pre-inking the ink rolls and other initial adjustment features. The maintenance section covers disassembly, parts diagrams and parts lists. Universal Mini-Coder - Porous Models: This manual covers all models of the Porous Mini-Coders. New features include detailed instructions for inking dry ink rolls, use of optional mounting bracket for 4 Oz. Reservoir Ink Cartridges in top mount installations and parts list updates covering Metric component options. Universal Midsize Coder - Porous Models: This manual covers all models of the Porous Midsize Coders. New features include detailed instructions for inking dry ink rolls, use of optional Reservoir Roll Covers and 4 Oz. Reservoir Ink Cartridges. New parts list updates cover Metric component options. Universal Conveyor Line Printers - Porous Models: This manual covers all models of the Porous Conveyor Line Printer. New features include detailed instructions for inking dry ink rolls, use of optional Reservoir Roll Covers for Side Mount and Top Mount installations and parts list updates covering Metric component options. Universal HPNP-100 Series Non-Porous Hand Printer: This manual covers all models of the Non-Porous Hand Printer. New features include a Quick Start section with photographic documentation, an expanded maintenance section and includes parts list updates covering Metric component options. 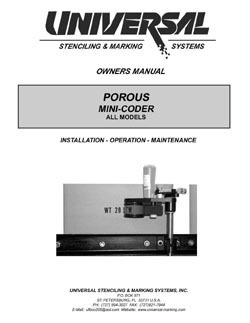 Universal Mini-Coder - Non-Porous Models: This manual covers all models of the Non-Porous Mini-Coder. New features include a Quick Start section with photographic documentation, an expanded maintenance section and includes parts list updates covering Metric component options. Universal Midsize Coders - Non-Porous Models: This manual covers all models of the Non-Porous Midsize Coder. New features include a Quick Start section with extensive use of photographs, detailed instructions for inking dry ink rolls, plus an expanded maintenance section. Special applications including printing on drums. An updated parts list includes Metric Ribtype options. Universal Conveyor Line Printers - Non-Porous Models: This manual covers all models of the Non-Porous Conveyor Line Printer. New features include a Quick Start section with extensive use of photographs, detailed instructions for inking dry ink rolls, plus an expanded maintenance section. Gang mount installations are explained and new parts list updates cover Metric component options. Universal Non-Porous Web Printer: This manual covers all models of the WPNP-400NI Non-Porous Web Printer. Universal Non-Porous Web Printer: This manual covers all models of the WPNP-400NI-12 Non-Porous Web Printer. 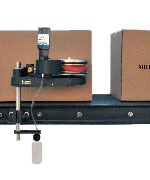 Universal Programmable Ink Delivery System: This manual covers all models of the PIDS Programmable Ink Delivery System. Universal Non-Porous Web Printer: This manual covers all models of the new WPNP-400NI-PIDS-D Non-Porous Web Printer. Universal Non-Porous Web Printer: This manual covers all models of the new WPNP-400NI-12-PIDS Non-Porous Web Printer.